Likes and Dislikes: Opposite But Equal? The phrase “dream car” is meant to be purely symbolic. Perhaps the plural version, “dream cars,” should be more widely adopted. Everyone with an automotive interest can relate to the personal nature of their choice rides. One special vehicle usually leads to a number of others—whether in reality or fantasy. No matter its size, a physical four-wheeled collection can often be organized. Some automotive stables are narrow in scope but wide in number. Others are quite the opposite. In the “Land of the Free,” individuality is celebrated. Collectors may focus on a specific brand, model, era, style or other characteristic. There are those that prefer a “matched set” of complementary vehicles. The most hard-core purists are concerned with factory originality. Meanwhile, those on the opposite side aim to push long-standing boundaries, reimagine traditions or even blatantly defy convention. Each form of creativity has its own merits. In this hobby, there is plenty of room for all types. The Bonneville Salt Flats Race Track has been revered by the automotive community for generations. It’s no secret that the historic site possesses rare physical qualities that has made it a perfect land speed racing venue since 1914. Notably, the track is listed on the National Registry of Historic Places and managed by the U.S. Bureau of Land Management (BLM). SEMA, along with other organizations and companies comprising the Save the Salt Coalition, is working closely with federal and state government officials and the adjoining potash mine owner to restore this hallowed ground. A 10-year salt pumping program is being developed to triple the amount currently being pumped to bring the Salt Flats closer to its former glory. If you haven’t already, be sure to contact your U.S. Representative and Senators and ask for their support in funding the measure using this link: https://www.votervoice.net/SEMA/campaigns/60483/respond Learn more at www.savethesalt.org. Earlier this month, two record-breaking vehicles were on display at the 2018 SEMA Show to promote the ongoing “Save the Salt” effort. 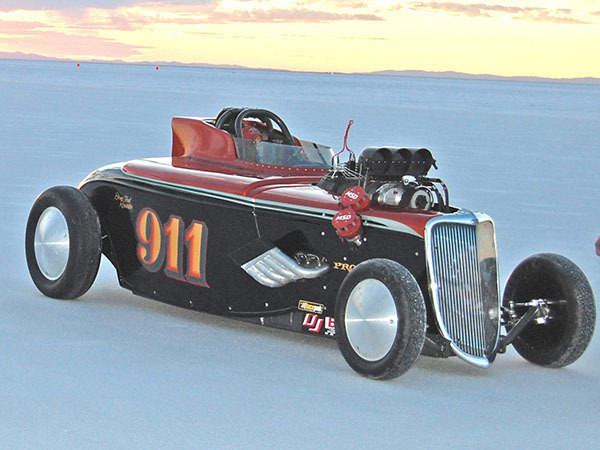 The 1934 “911” Ford highboy roadster (pictured above) with a 4,000+ horsepower engine hit 301-mph on the Flats. It is owned by Dave Davidson and his team includes John Beck and Donny Cummins. The Guthrie-Levie Racing sidecar motorcycle was on display as well—John Levie reached an incredible top speed of 320.304 mph in this unique vehicle. Attendees were able to view these impressive machines and ask questions about what it takes to challenge land speed records. Renowned owner/builder Rick Vesco and driver Dave Spangler of the Turbinator II record-holder were also on hand in Las Vegas. 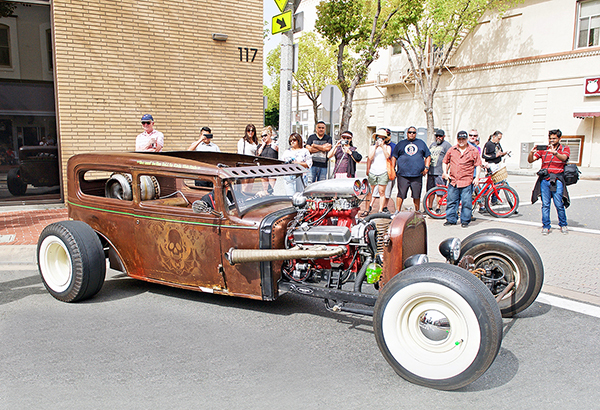 This legendary streamliner was featured at last year’s “Save the Salt” display. The racing team recently celebrated quite a milestone: Turbinator II became the first wheel-driven car to exceed 500 mph! In fact, it is one of at least five vehicles to be driven over 400 miles per hour during Speed Week at Bonneville. Congratulations to each of these teams on well-deserved places in the record books—and best wishes during next year’s season!